By purchasing the shares held by Artemis and Miton, Dave King has taken a significant step towards influencing events at Rangers. With another group of wealthy Rangers fans - Douglas Park, George Letham and George Taylor - having bought Laxey Partners' 16% stake, the shareholder dynamic has drastically altered. Mike Ashley still owns 8.92%, while Sandy Easdale still owns 5.2% and holds the proxies for another 21%, but there is now a large group of shareholders with enough power to mount a challenge to their control of the club. 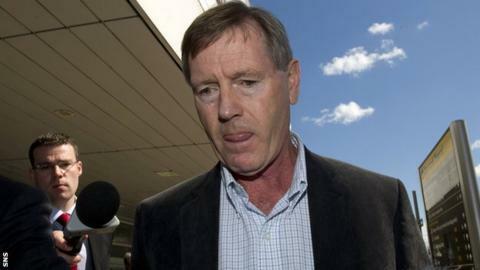 Here, BBC Scotland's Richard Wilson examines the events of another dramatic spell at Ibrox. Why are these companies selling up? Laxey Partners sold after their representative, Norman Crighton, was suddenly and surprisingly voted off the board. That now looks like a strategic mistake by chairman David Somers, chief executive Derek Llambias and non-executive director James Easdale, because Laxey went from being generally supportive of the board to wanting out. Artemis and Miton sold up because they no longer see value in their investment. The institutions have been passive during the turmoil and power struggles at Ibrox, and despite taking a significant loss on their shares, they no longer wanted to be involved with the club, which needs at least £8m in fresh investment to keep operating. What are the voting blocks? Ashley and Easdale have been aligned so far, and control around 35% between them. The Park group and King now hold around 35% as well, but can count on the support of the fan groups - 1.5% - individual fans - 12% - and other fan shareholders, such as former managers Ally McCoist and Walter Smith and former chairman Malcolm Murray. River & Mercantile still hold around 6% and are also thought to be supportive of change and likely to back King. This, in theory, could see more than 50% of shareholders being naturally aligned. What about concert party rules? The takeover panel reopens from the festive break on Monday, so nothing will happen until then. If a shareholder does complain that the Park group and King are working in concert, the panel will need to adjudicate. It is, though, a regulatory matter and based on fact/representation, and while both groups insist they bought shares independently of each other, there is little concern about the issue. Corporate rescue can be excused from the ruling that a concert party that holds more than 30% is obliged to make a mandatory offer for the rest of the shares at the highest price either party has paid in the preceding 12 months. As it stands, Rangers International Football Club require funding to prevent insolvency. Easdale and Ashley also own or have control of over 35% between them, while any shareholder who makes a complaint will effectively be reducing the amount of money that the Park group or King can invest in the club, because some of their funds would be needed to make the offer. Nonetheless, it is not a critical issue because more than 50% of the shares are held by fans who will not want to sell. Of the remainder, 35% is held or controlled by Ashley and the Easdales, and if they sell they remove themselves from power. That leaves around 15% of shareholders who may accept an offer, but it would be made at around the 20p mark, so would not require a hugely significant outlay. What does this mean for Ashley? Rangers are still in a critical state financially. Ashley had planned to provide the necessary investment in a share issue, but was refused permission by the Scottish Football Association board to raise his stake above 10% because he also owns Newcastle United. The Sports Direct owner's long-time associate Llambias was appointed chief executive. Under the terms of a £3m loan he provided, Ashley is allowed to appoint another director. The club can either borrow more money from Ashley or proceed with the share issue, and the Park group have already offered to invest up to £6.5m for all the shares not bought by existing shareholders. That, though, would remove control from Ashley. He is thought to have acted to protect his commercial deal - Sports Direct are partners in Rangers Retail, a joint venture - and could now decide to negotiate with the Park group and, or King. What would trigger a change at boardroom level? If the Park group and, or King seek boardroom representation, overtures will be made to WH Ireland, who manage RIFC's listing on the Alternative Investment Market. WH Ireland are believed to want a swift resolution to the turmoil and financial crisis at Ibrox, but the Park group and, or King could call an extraordinary general meeting to allow shareholders to vote on proposed boardroom changes. What does this mean for the upcoming share issue? In practical terms, it allows the Park group and King to participate, because current shareholders are obliged to be offered enough shares to maintain their stake. They can also then apply to buy any of the shares not taken up. Unless Ashley or the Easdale bloc invest to maintain their stakes, they would lose further control. Does this mean Rangers now have enough money to get to the end of season? The share issue could raise up to around £6.5m, depending on the price of the shares offered. This would only be the first round of new fundraising, though, with Ashley's £3m loan due to be paid back by April. If boardroom changes take place, supporters may be enticed back - 15,000 refused to renew their season tickets in the summer - which would help the finances to an extent, but currently a large section of the fan-base remains opposed to Ashley and the Easdales. Very little, other than the fact that a potential conclusion to the financial problems could prevent the board having to sell another player to provide working capital. Lewis Macleod was sold to Brentford for £1m, and Lee Wallace remains the subject of much speculation. Is Ally McCoist now likely to come back as manager? No. McCoist made the decision to leave. He is likely to be supportive of the Park group and King, but there is no suggestion of him returning as manager. Will the fans who seem to be staying away now come back? Perhaps initially, in small numbers, but the majority will wait to see what happens next. They would be naturally aligned to any efforts made by the Park group and King, but remain in opposition to the current directors and Ashley. Until there has been meaningful change in the boardroom, fans are likely to continue to stay away in protest. The financial situation needs addressed as a matter of priority, and with that could come the beginnings of a long-term solution. If Ashley decides to fight his corner, the turmoil could continue for several months. The fact that Park and King, in particular, are now involved financially is likely to ensure that they will seek to achieve their ambitions, however long it takes. Fans, also, have shown commitment to bringing the club back under the control of fellow supporters.